Professional project management, or owner's representatives, are an often overlooked profession in the construction industry. Construction is completed on the new 383,000-square-foot Prebys Cardiovascular Institute and adjacent 26,000-square-foot central energy plant on the Scripps Memorial Hospital La Jolla campus at 9888 Genesee Ave. Contractors connecting the world with power, advanced lighting, renewable energy and integrated systems. Just days after raucously celebrating its 10th anniversary aboard the Maritime Museum’s renowned Star of India, terra firma was on the brain for many of Watkins Landmark Construction’s San Diego team members. Specifically, the awaited — and occasionally dreaded — company moving day had finally arrived. In April 2014, Swinerton Builders San Diego division broke ground on the Gaslamp Courtyard by Marriott Hotel in Downtown San Diego. An estimated $20 million project, work expects to wrap up by the end of the summer. Project Design Consultants, a local multiservice design firm, is headquartered in downtown San Diego and provides civil engineering, surveying, planning and landscape architecture services. Founded in 1976, PDC has been part of the local region for almost four decades and has worked on more than 90 projects throughout the downtown area. Baker Electric, serving Southern California’s electrical needs since 1938, continues to make a bold impact in and throughout San Diego County with projects that have ranged from installing intricate electrical systems at residential and civic properties to new, sweeping solar installations on buildings throughout the region. Often our industry will place a title on a procedure or a concept that to many may be new, but to others such as davisREED has been a proven process for years -- we merely practiced it without a title. In the late ‘70s, the catch words “construction management” became popular. And soon enough, seminars nationwide addressed the negotiated, fast-track process during which the contractor is involved in the development of a project from the conception to the end in lieu of the traditional bid process. But it was not a new process, only the naming was new. San Diego County businesses have special opportunities to help the region conserve water through the adoption of water-efficient practices indoors and outdoors during what is shaping up to be a fourth consecutive dry year. Those upgrades can boost the bottom line and demonstrate the business’ dedication to the efficient use of natural resources. Dynalectric, with more than 40 years of working in America’s Finest City, has been a major contributor to San Diego’s evolving footprint and skyline. Our clients know us as a technologically advanced and forward-thinking electrical contractor, committed to delivering high-quality safe projects. We’ve grown our organization and its capabilities to be responsive to the needs of our clients as technology and construction has become increasingly sophisticated. Add to that our core values -- integrity, discipline, commitment to safety, transparency, mutual respect and team work -- and you have the key to our philosophy of endeavoring to deliver a customer experience that exceeds our client’s expectations. Bonds of about $10.5 million have been obtained for use in the ongoing construction of the Urban Discovery Academy, a K-8 public charter school in San Diego’s East Village neighborhood, said Gordon Kovtun, founder and principal of KCM Group, a full-service construction management and consulting firm that is overseeing the relocation and construction of the school. San Diego County's reputation as one of the nation's top beer-making centers should be burnished in the next couple of months, as the region opens its 100th brewpub, with dozens more potentially in the pipeline. As San Diego heats up this spring and summer, so too will a variety of enterprising dining, dancing and event venues. Large in scale and backed by big names, the latest entrants to San Diego’s hospitality scene will offer international flavors and stunning vistas. About eight months from now, the city plans to unveil a new downtown attraction with the Horton Plaza redevelopment. New, of course, can mean different things. In this case, it's more like taking a constantly remodeled vintage car, returning it to what it was at its beginning, and parking it in a nicer garage with all the bells and whistles. The San Diego Association of Governments and the North County Transit District are moving forward on a $31 million project to replace four bridges that cross Los Peñasquitos Lagoon. Caltrans recently held a groundbreaking ceremony to mark the beginning of construction on the Interstate 5/Genesee Avenue Interchange Project, which will replace the existing six-lane overpass with a 10-lane structure to improve traffic flow. In roughly two years, students, staff and the Chula Vista community will have new aquatics facilities, indoor sporting venue and fitness labs as Southwestern College is getting ready to start construction on its new Wellness Center. The Port of San Diego sent out a request last summer for qualifications on its plan with the city of Chula Vista to build a hotel and convention center along Chula Vista's bay front, a major component of the city's Bayfront Master Plan. A "whopping" response was received, "but it turned out to be a good one," Chula Vista City Manager Gary Halbert said recently. Here’s the latest news on some long-term projects happening around the county. Projects are listed by estimated cost. Construction’s economic future is set to continue improving throughout the course of 2015. Not only are economists and industry experts optimistic, but so are small business owners in the construction sector. The majority says they are positive about their business’ outlook in the year ahead, according to a report by small business insurer, Hiscox. More than 450 multifamily units and at least 14,000 square feet of commercial space are in the works for Bankers Hill, with construction beginning on several projects, and at least one more expected soon. General contractors, for the most part, say they are “cautiously optimistic” about the construction industry in San Diego this year, with smaller projects holding up backlogs and numerous bidders still vying for projects. Find out what construction plans are in the works and how industry leaders are changing our region's landscape this year. Find out about current construction plans and how developers are changing the region's landscape. 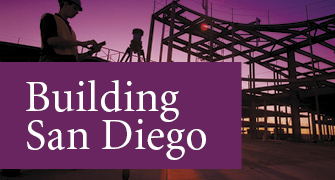 In the face of a changing marketplace and continual challenges for the industry, find out what construction plans are currently in the works and how San Diego developers are changing the region's landscape.